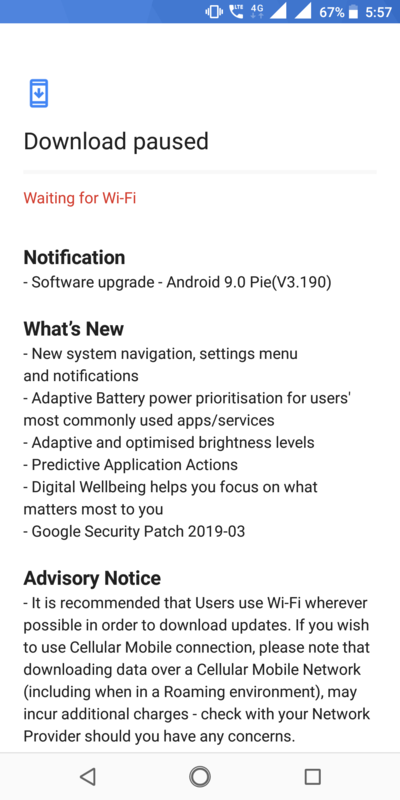 Nokia 5.1 Android Pie 9.0 Update Arrived In India: Nokia 5.1 is a Phone launched in May 2018 on Android 8.0 Oreo. This Nokia Phone comes with Clean Stock Android and HMD Global is quite focusing on the Android Updates of Nokia Phones. Nokia 5.1 is receiving its First Major OS Upgrade of Android Pie Update in India. Talking to the Point, Nokia 5.1 is receiving a New Android Update which includes Android Pie 9.0 and Some System enhancements. Some random Nokia 5.1 users are getting Android Pie update with build no: V3.190. As usual, The Android Pie update for Nokia is rolling out in Phases Which means it is rolling out for some Nokia Users. If You want to install, Go to Settings > Search System updates > and Check the updates. If the update is available, Make sure You download over WiFi network. Any News related to Nokia 5.1 Android Updates will be offered to You on Nokia Talks Website.